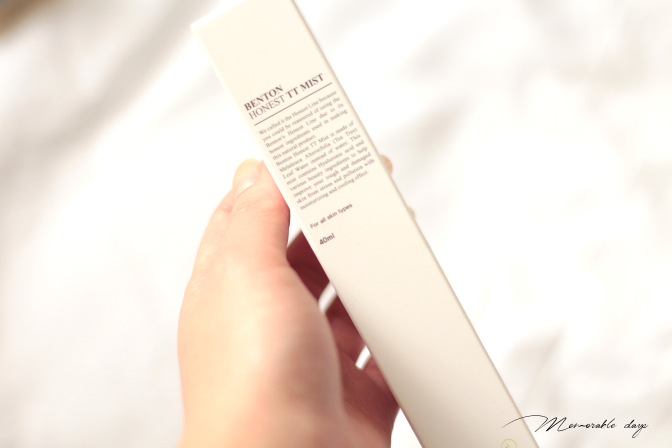 Review: Benton Honest TT Mist | Memorable Days : Beauty Blog - Korean Beauty, European, American Product Reviews. Hi all! Even though it's mid January 2016 already, I just wanted to say Happy New Year and I wish you all the best! Stay healthy girls! My apologies for the lack of posts. I've been extremely ill recently so I really needed some time to recover and I am still in my recover status actually. Anyways, back to the main topic of this blogpost. 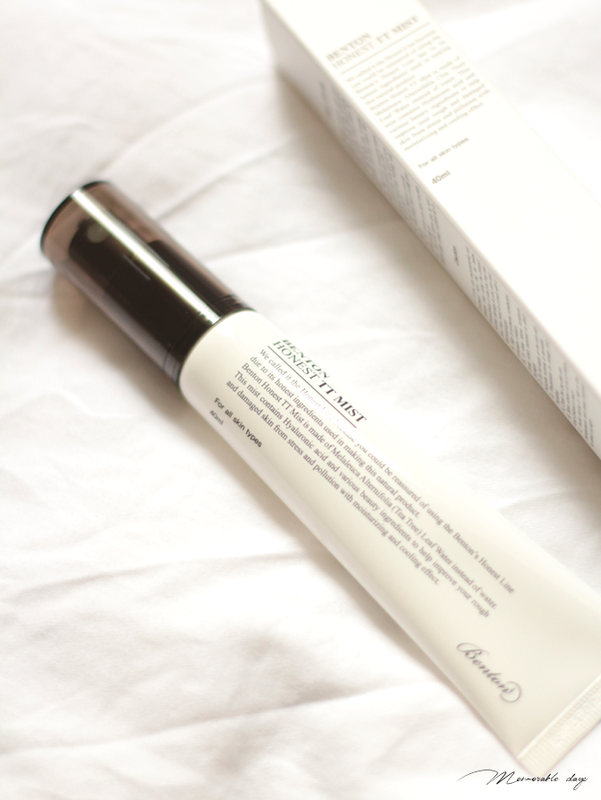 Today I am going to review the Honest TT Mist of Benton. 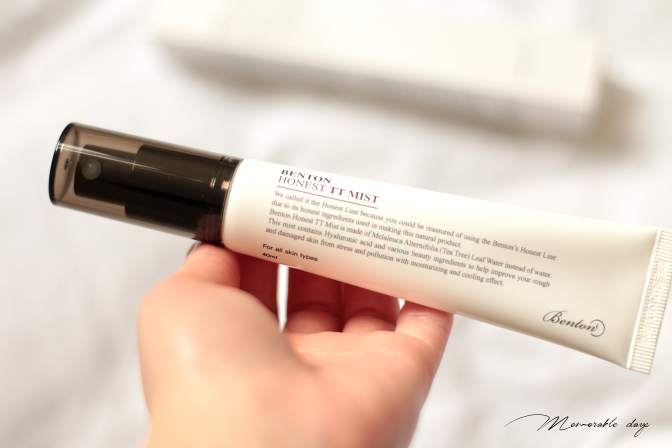 Benton has become such a popular brand and a lot of people with sensitive skin love their products! Read more about this mist in today's blogpost. 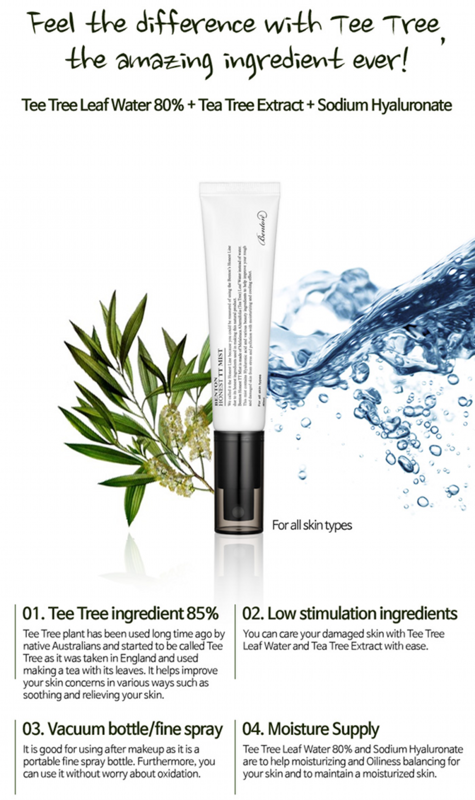 Benton Honest TT mist is made of tea tree leaf water instead of normal water. This mist contains hyaluronic acid and various beauty ingredients to help improve rough and damaged skin from stress and pollution with moisturizing and cooling effect. It's suitable for all skin types - yes, even the sensitive ones: it's suitable for irritated skin, imbalanced skin, oily skin that needs some moist, tight and dry skin that needs moist and damaged skin that needs prevention and improvement. It contains 40ml of product. 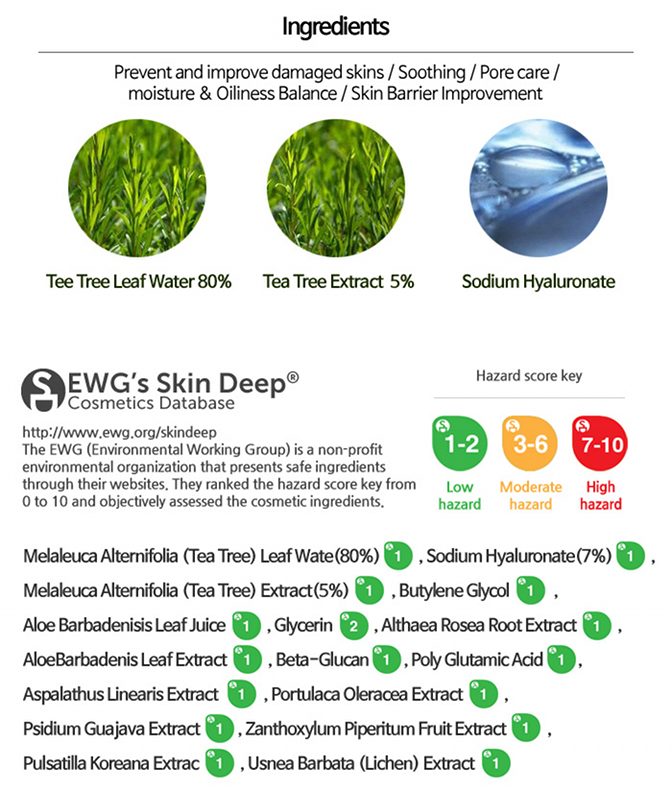 I love how they also show that it's close to pH6.0 since the best pH for the skin is 5.5. When I tested the pH level out, it was indeed around pH6.0. It comes in a black and white packaging and a spray tube. It's very easy to get the product out and it sprays equally onto the face. The mist is just like water and it doesn't have a scent which is a good thing. The texture is very lightweight and non-sticky which is a pro. I'm glad to see all safe ingredients in this list! You can use it as a skin toner or use it as a mist. When using as a skin toner, you can spray it onto your skin directly (please spray about 30cm distance) and then softly pat it onto the face. I normally just use my hands to pat it on instead of a cotton pad. When my skin feels extremely dry I just spray 2 layers of it. 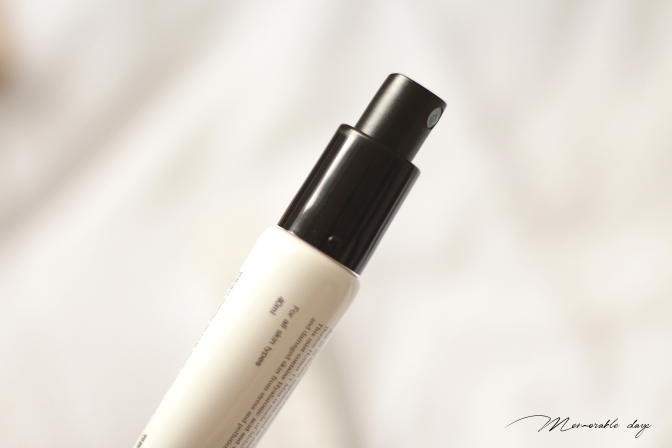 When using it as a mist (also spray about 30cm distance), you should spray it all over the face after applying makeup. 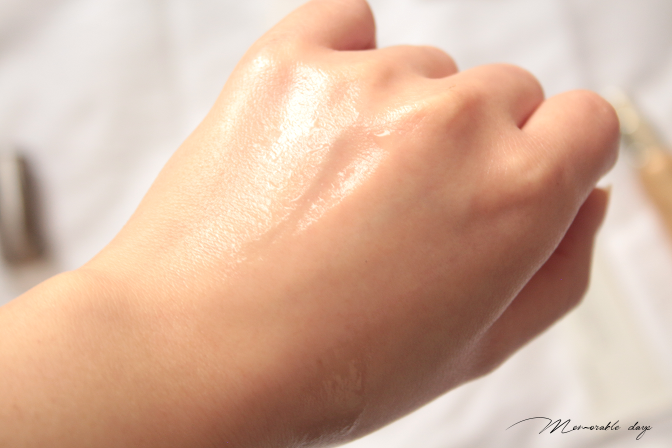 You can re-spray from time to time when your skin feels dry. This was sent to me by roseroseshop.com for review purposes. It's currently on sale and sold for USD$5.96 for 40ml of product. They ship worldwide. This is such a bargain! I can't believe how inexpensive this mist actually is now! - Feels lightweight and non-sticky. I am in love with this product! I have been using this product as a skin toner for a good 2 weeks now (day and night) and my skin is definitely loving it! My skin has been very sensitive lately since I had a food allergy it turned from a combination dry skin into a very sensitive and dry/flakey skin, so I was in need for some good products which is suitable for my skin type and this was PERFECT! 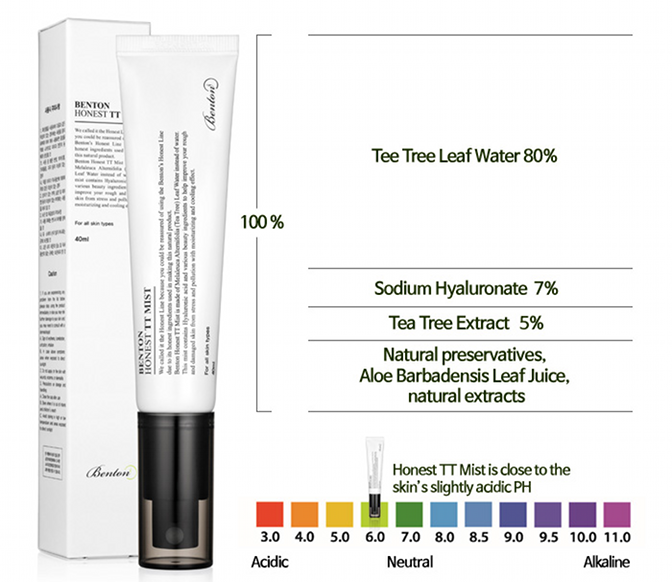 The pH level is great, it balances my skin out, it contains natural ingredients (lots of tea tree) which calms and soothes the skin and it keeps my skin moist and fresh. It didn't give me a breakout which I am really happy about. I got to say that I am really impressed with this product and I even have added this mist into my holy grail products! It's not only good as a toner but also as a mist, it keeps the skin moist for hours and it cools the skin as well which is great for the hot days. It really saved my skin after the allergy that I had. I would definitely repurchase this mist again after I am done with this one. note: description pictures are from bentoncosmetic.com, this product was sent to me for review purposes, but this didn't affect my opinion about the product, see disclaimer.